Liskow & Lewis is proud to announce David Leefe was awarded the Louisiana State Bar Association’s 2018 President’s Award. David was selected by the LSBA President for exemplary service to the Association throughout the Bar year. David has practiced law for over 30 years, all with Liskow & Lewis, and his experience includes a broad range of litigation and contract matters. 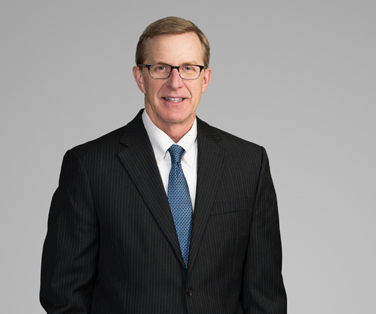 His practice emphasis is on maritime and offshore personal injury and property damage, drilling and downhole litigation, contractual indemnity, insurance coverage, maritime liens, and casualty investigation and response. David chairs the firm’s 20+ member Maritime, Oilfield & Insurance section and serves as a point of contact for clients in need of maritime and casualty-related assistance. David plays an active role with the Louisiana State Bar Association. He has served as a member of the LSBA House of Delegates for more than 20 years and was elected to the LSBA Board of Governors for the 2014-2017 term. David is particularly proud of his service as the longtime Chair of the LSBA Client Assistance Fund Committee, whose mission is to reimburse individuals victimized by lawyer misconduct. David received his undergraduate degree from Louisiana State University and his Juris Doctor from Loyola University College of Law.